Côtes-d'Armor (French pronunciation: ​[kot.daʁ.mɔʁ]; Breton: Aodoù-an-Arvor), formerly named Côtes-du-Nord, is a department in the north of Brittany, in northwestern France. Côtes-du-Nord was one of the original 83 departments created during the French Revolution on 4 March 1790. It was created from part of the former province of Brittany. Its name was changed in 1990 to Côtes-d'Armor (ar mor meaning "the sea" in Breton and Côtes meaning "coast" in French). The name also has a historical connotation recalling the Roman province of Armorica. 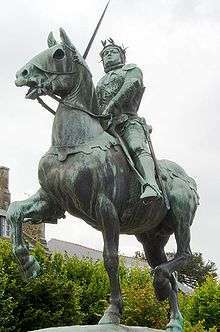 The present department corresponds to most of historical Trégor, part of Cornouaille, and most of Saint-Brieuc. Côtes-d'Armor is part of the current administrative region of Brittany and is surrounded by the departments of Finistère, Morbihan, and Ille-et-Vilaine, with the English Channel to the north. The inhabitants of the department are called Costarmoricains. 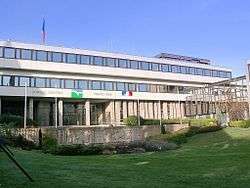 The Côtes-d'Armor has usually been a left-wing holdout in a historically strongly clerical and right-wing Brittany, due to the department's more anti-clerical nature, especially in the inland area around Guingamp, a former Communist stronghold. The President of the General Council is Claudy Lebreton of the Socialist Party. 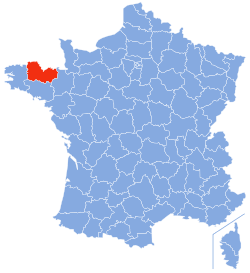 The western part of the département is part of the traditionally Breton-speaking "Lower Brittany" (Breizh-Izel in Breton). The boundary runs from Plouha to Mûr-de-Bretagne. The Breton language has become an intense issue in many parts of Brittany, and many Breton-speakers advocate for bilingual schools. Gallo is also spoken in the east and is offered as a language in the schools and on the baccalaureat exams. The English born poet Robert William Service (1874–1958) known as the "Bard of the Yukon" is buried in Lancieux. Wikimedia Commons has media related to Côtes-d'Armor.